Water temperature has direct and indirect effects on nearly all aspects of stream ecology. For example, the amount of oxygen that can be dissolved in water is partly governed by temperature. As cold water can hold more oxygen than warm water, certain species of aquatic invertebrates and fish with high oxygen demands (including popular sport fish such as some trout and salmon) are found only in these waters. Temperature also influences the rate of photosynthesis by algae and aquatic plants. As water temperature rises, the rate of photosynthesis increases providing there are adequate amounts of nutrients . Metabolic rates of most stream organisms are controlled by temperature. Metabolic rate is the speed at which cells conduct the chemical processes of life. As most aquatic animals are cold-blooded, their metabolic rate is faster in warm water. Therefore, they need more food and oxygen in warm water and release more wastes. Of course, this increase in metabolic rate occurs only up to a point before the upper temperature tolerance is exceeded and the organism dies. Approximate upper limits range from 38°C (100°F) for fish and 50°C (122°F) for aquatic insects to 73°C (163°F) for blue-green algae. However, elevated temperatures lower than these maximum limits still are stressful, especially to organisms at sensitive juvenile stages. One remarkable habitat where water temperature is a key factor is the hot spring associated with geothermal activity. The beautiful colors seen in the steaming pools and streams are actually microbial mats of living organisms, many of which need high temperatures to grow successfully. * Spring habitats above 55°C (131°F) are mainly inhabited by specialized bacteria capable of oxidizing sulfides in the sulfur-rich waters. As the water flows away from the source and becomes cooler, a sequence of different species with different temperature tolerances occurs—a perfect example of how water temperature controls the ecology of a stream. Except for the special case of geothermal warming described above, streams are naturally heated by the Sun and by ambient radiation emitted by the Earth's atmosphere and the Earth itself. Despite the Sun's heat, the Earth's surface actually receives most of its energy from atmospheric re-radiation. Shading of streams by riparian (riverbank) vegetation can reduce stream temperatures by as much as 10 Celsius degrees (18 Fahrenheit degrees) as well as reducing the daily and seasonal variation in temperature that would occur if the stream were unshaded. This variation is particularly important during low flows in summer, because unshaded streams can become so warm that many invertebrates and fish are badly stressed or killed. In wider rivers, riparian shading is less significant but water temperature may be governed by runoff and by warming on exposed floodplains as well as heat carried by groundwater entering the river. The temperature of groundwater varies less than that of surface waters and can buffer variations in surface temperature in waterways that are significantly fed by upwelling groundwater. Some species of fish in warm-water streams lay their eggs in nests excavated in the gravels of upwelling zones, apparently because the water is cooler and able to hold more oxygen. Human activities that alter water temperature influence all the aspects of stream ecology described above. For example, clearing of riparian vegetation for timber or through overgrazing by livestock reduces shading and warms the stream. In many places, the banks of cleared rivers slump and erode away, causing the channel to become broad and shallow as deep holes are filled in by sedimentation . * During hot weather, these broad, shallow streams are more likely to heat up. In urban areas, not only are most streamside trees usually removed but also rainwater draining from hot paved surfaces (such as roads and parking lots) raises the stream temperature. In dry areas, water flowing along exposed irrigation channels or across open fields before entering streams is also a source of heat. Industrial activities also directly influence stream temperatures. For example, almost half the water withdrawn in the United States each year is used for cooling electric power plants. Water is drawn from a nearby river, passed through the plant, and then returned at a higher temperature to the river. Riparian (streamside) vegetation helps shade streams and hence helps maintain a lower temperature than a nonvegetated stream. 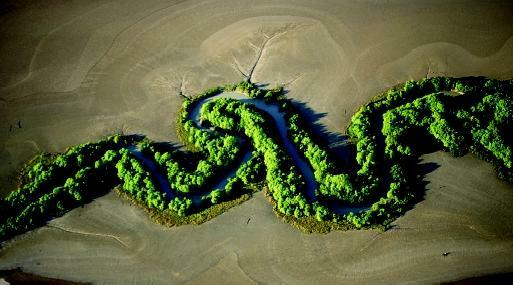 This tree-lined river on the mud flats of Kakadu National Park, Australia also illustrates the meandering nature of streams. water temperatures are cooled for over 300 kilometers (186 miles) downstream of Burrendong Dam. This has reduced native fish populations downstream but has favored species of exotic fish able to tolerate the cooler water. There has been such concern about thermal pollution due to rapid or sustained unnatural increases or decreases of water temperature that it has been used as a reason for listing streams as targets for rehabilitation measures. For example, under Section 303 (d) of the U.S. Clean Water Act, many of the streams that appear on the lists of surface waters not expected to meet various state water quality standards exceed the temperature guidelines on repeated occasions. Usually, elevated temperatures have resulted from the removal of riparian zone trees, and partial rehabilitation can be achieved by strategic replanting. However, where catchment runoff from cleared fields contributes to high stream temperatures, the solution of the problem is more difficult. Similarly, technological solutions to the use of water in cooling plants are complex, but there has been some success in temporarily storing the water in offstream reservoirs before release back to the river. Multiple off-take structures that can draw cool water from deep in a reservoir as well as from its warmer surface are commonly used to reduce the impact of cool water released from high dams. Many scenarios of global warming predict rises in mean stream water temperatures as well as in daily and seasonal variations. Solutions at this global scale require worldwide cooperation, but there is encouraging progress being made by countries willing to reduce emissions that contribute to the greenhouse effect . From replanting trees to holding large-scale conventions on global warming, efforts to solve this pressing issue are important because of the wide-ranging influences of water temperature on stream ecology. SEE ALSO Clean Water Act ; Ecology, Fresh-Water ; Fresh Water, Physics and Chemistry of ; Modeling Streamflow ; Nutrients in Lakes and Streams ; Pollution of Lakes and Streams ; Pollution Sources: Point and Nonpoint ; Stream Health, Assessing. Allan, J. David. Stream Ecology: Structure and Function of Running Waters. London, U.K.: Chapman & Hall, 1995. Boulton, Andrew J., and Margaret A. Brock. Australian Freshwater Ecology: Processes and Management. Glen Osmond, South Australia: Gleneagles Publishing, 1999. Dodds, Walter, K. Freshwater Ecology Concepts and Environmental Applications. San Diego, CA: Academic Press, 2002. Larson, Larry, and Pat A. Larson "The Natural Heating and Cooling of Water." Rangelands 19 (1997):6–8. Poole, Geoffrey, C., and C. H. Berman. "An Ecological Perspective on In-stream Temperature: Natural Heat Dynamics and Mechanisms of Human-caused Thermal Degradation." Environmental Management 27 (2001):787–802. * See "Land Use and Water Quality" for a photograph showing a stream whose banks have been stripped of vegetation and therefore are eroding. * See "Life in Extreme Water Environments" for a photograph of a hot spring encircled by microbial zones largely defined by temperature.